Having appeared at the first festival in 1999, this Dutch five-piece were not a totally unknown quantity. Formed way back in 1995 they've released a min-CD and a full album Watching the Unseen a couple of years ago. They ply a fairly board mix of music ranging from almost ProgPop to quite adventurous ProgMetal - a less progressive Pain of Salvation would be a common reference point. A good tight unit, they received a good response from an enthusiastic crowd. Afterwards I grabbed a promo with three unmastered tracks from their forthcoming debut on DVS Records. It shows plenty of promise especially the closing track Journey Into The Unknown. Worth keeping an eye on. I first caught this promising new Danish band this summer at the Sweden Rock Festival . Having since been highly impressed by their debut album Ripples In Time, I was rather looking forward to seeing them again. Hard to pidgeonhole - early Rush occasionally springs to mind - Chrome Shift has received warm praise across the board for their debut disc. Yet, whilst very impressed by their playing in Sweden, the total lack of stage presence rather let them down - the words 'rabbit' and 'headlights' sprang to mind. 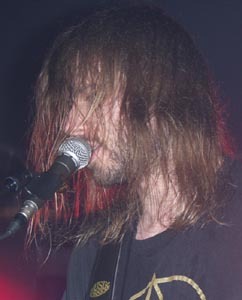 Since then, singer/frontman Rasmus Bak seems to have had a personality transplant. All pained expression and frantic hand gestures - now much more a case of the fox leading the hunt on a merry chase. It provided a much more visual show but unfortunately it was taking it too far in the other direction for me - and his musical performance suffered as a result. He missed too many notes and while the band plays a fairly heavy slice of ProgMetal, their music needs an equal amount of light and shade to really work. This was too shady. The set was made up of the best tracks from Ripples.. plus two or three tracks described as 'not on the album' (Worlds and Chapter 19 were two I picked out). 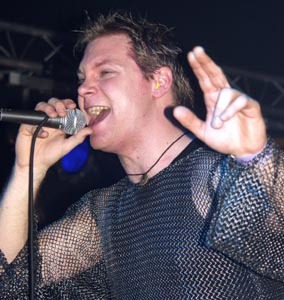 When Rasmus managed to reign himself in a bit, songs like In My Own Dreams and the closer Nightmachine really did work. The instrumental Kosmonauten Er Dod was also much better beefed up live, than on the album. Don't get me wrong, I did enjoy their set and they received a great response from an impressive crowd at the front. It's just that this is a young band with such potential, that I know if they could strike the right balance in a live setting they could be so much better. The crowd had noticeably thinned for the arrival of these Italians and from the mumbled vocals and gothic twanging of the opening track, Novembre were unlikely to be to everyone's taste. Atmospheric, Gothic, Death Metal stands somewhere near Celine Dion in my musical dislikes. The opening three songs, were two more than I could take and I sought refuge in the downstairs bar and a game of pool with members of a French metal band. However all five of the others I was with, stayed and thought Novembre were the best band of the day until Vanden Plas - so I guess it's down to personal taste. 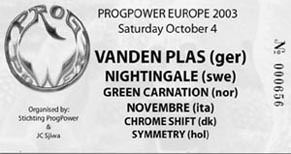 One of the great things about festivals like ProgPower is the chance to try bands that you'd never normally come across. Perhaps I should have heard of these Norwegians before, but until 6.30pm on Saturday October 4th I knew nothing. The only green carnations I'd ever seen were in my grandad's garden! But heck, this was a damn fine set, from a damn fine band. I was hooked from beginning to the end and the hour literally shot by. I believe they've only recently started to play live but everything in the performance was spot on - they even managed to get a decent sound! 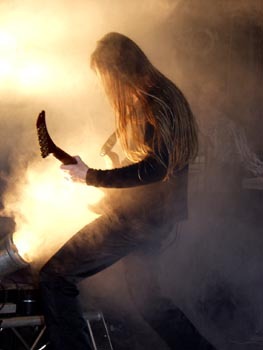 When I learnt that the guitars are delivered by Tchort (ex-Emperor, Blood Red Throne, Carpathian forest, Satyricon) I was expecting a near-death experience. However while the music and lyrics are certainly very dark, musically the band is thankfully far removed from his former bands, mixing rock, metal and gothic with a fair sprinkling of folk influences. 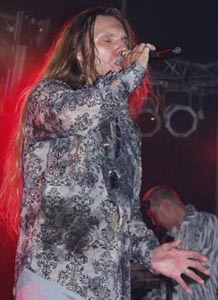 Vocalist Kjetil Nordhus provided a solid centrepiece, but it was the music that did the talking. Tracks like Boy In The Attic from their current release A Blessing In Disguise had class stamped all over them but the highlight was the playing of a huge chunk from their one-song-concept-album Light Of Day, Day Of Darkness. Heads started nodding after the first track, people were clapping along by the second and by the third, pretty much the whole hall was won over. Ah well another few albums to add to my shopping list! The surprise of the festival for me and many others I spoke to. Hugely impressive. 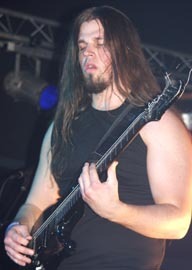 For much of the set here, the music on offer was more doom-tinged hard rock in support of the band's current album Alive Again. Perhaps it's something that needs more listens but there was very little movement or personality from the stage to engage me either. Only on the last three tracks especially the epic Eternity and a superb Black Tears from one of his former projects did they really grab my interest. When I saw them at Progpower USA two years ago I was disappointed that Swano had the lyrics next to the mic' stand. Here it seemed he had at least learnt the words - that was until I went to the front and discovered they were merely hidden, taped to his monitor! Along with Threshold, Kamelot and Ark (where's the next album? ), Vanden Plas is one of the few bands that, whatever they do, seems to press all the right musical buttons for me. Having finally got to see them play earlier this year, I was well up for a return visit and again Andy Kuntz and Co didn't disappoint. Pure professionals in everything they do, it may be a little too polished for some but you can't deny, that with the likes of Far Off Grace and the orgasmic Rainmaker, they've some of the finest slices of ProgMetal ever created. It seemed the band was well up for this gig and seemed to really enjoy themselves - Andy Kuntz in particular was a bundle of energy. 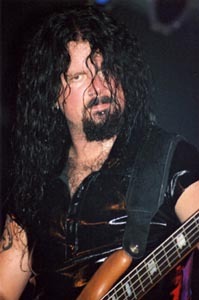 Leaning in the front row, over the bass monitor, also reinforced what an invaluable contribution Torsten Reichert makes to the band's crunching sound. It was pretty much the same set as previously and my only complaint was that it may have been nice to have popped a couple of unusual/rarely played older tracks as a treat for fans who've seen them before. Four days later, as I write this, my neck is still aching but this set was worth the journey from England alone and just about the highlight of the weekend. Once again it was good to see a healthy crowd had turned up to see the first band of the day and the interest was rewarded by another good opening set. 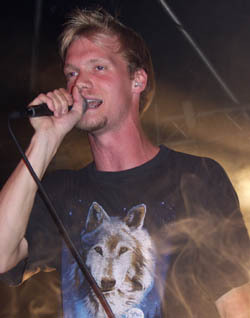 A young band from Holland, Xystus seem to have a fairly wide range of musical influences. We had some fairly straight Power Metal and some hard-edged Prog, but on a first listen they were most effective with the songs that sounded like a more progressive Kamelot. Their frontman handles all guitar as well as vocal duties, which maybe needs looking at if the band is to progress. On this showing, I think he'd be more effective as just a frontman. But if he wants to do both, then the band should at least consider a second live guitarist to fill out the sound and give a bit more movement on stage. Their debut album is due out soon on DVS Records and Xystus did enough to win some new fans here. With Xystus having done a good warm up job, like a class of schoolchildren at Christmas, there was an eager sense of anticipation in the hall for the arrival of this Swedish band. 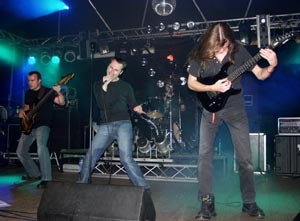 Their debut album Extention of the Wish was a great slice of guitar-based ProgMetal. This year's super II=1 is a slightly lighter, more progressive disc - and a genuine classic of the genre. Opinion is divided over which is the best and so thankfully the set took a good selection from each. As a result the Andromeda hour was a real rollercoaster ride with some flowing keyboard sections, beautiful melodies and some real neck-breaking riffing. In David Fremberg they have a real gem of a vocalist and in Johan Reinholz a guitarist from the top drawer (the rest of the band ain't bad either!). A rare gig by the band to date, it's fair to say their stagecraft can be developed much further but the crowd was too busy lapping up the music to care too much anyway. The versions of Encyclopaedia and Mirages were on their own the two best slices of progressive metal I heard all weekend. The only complaint was that it was over all too quickly. I want more gigs now!!! If I was eager to see Andromeda, I was practically gagging in anticipation for these Norwegian progmeisters to get onto the stage. Their current album Celestial Entrance was actually the first that I ever reviewed for DPRP. Mixing early Queensryche with sci-fi lyrics, epic arrangements and some very heavy guitar work, it was one of my favourites last year and still gets regular outings to my stereo. Sadly, other than their successful appearance at the Progpower USA a month previously, I don't think the band had previously played outside of Scandinavia. So this was a real treat. And having spent almost a day travelling to Holland, it was clear that the band was determined to give a good show. I'm afraid they didn't put on a great show though - it was superb! The fact that only one track was played from their debut suggests they share my view that it was a poor album. Instead we had as much of the current disc as they could squeeze in and ... well Pagans Mind were just immense. 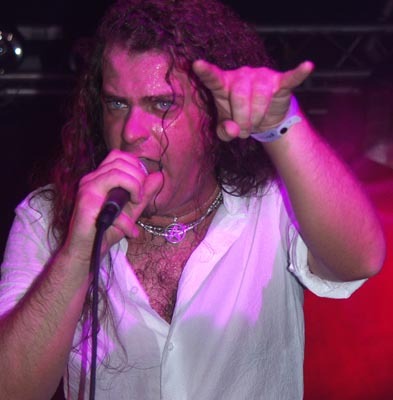 In addition to a great vocal range, singer Nils K Rue has a great stage presence� - really in yer face, constantly leaning into the crowd and pouring his heart into every word. 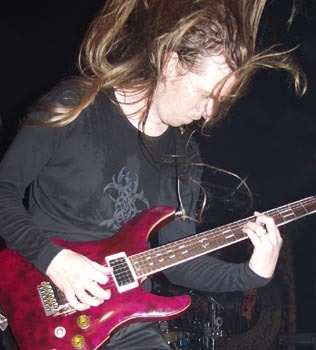 I didn't really notice the lack of a second guitarist and I must say that six stringer Jorn Lofstad is a star in the making. But to single anyone out would be unfair as this was truly a band performance. Again the sound did them no favours and Nils seemed to have constant problems with his monitor, but I think the band seemed to be many people's favourites. They've already started writing their next album and I duly expect them to get an invitation to return next year - but much higher up the bill. On two previous occasions Everon had been booked for this festival, only having to pull out due to health problems. Ironically it was this year's last minute withdrawal of fellow Germans At Vance that opened a slot for them to finally appear. Now, I was a great fan of their Fantasma disc, but last year's double bill of Flesh and Bridge did nothing for me at all. Listening to this set I came to the conclusion that for me, their lighter, NeoProg material suits their sound and especially suits Oliver Philipps' voice, more than when they take a more ProgMetal approach. With just an hour-long set, what we had was a good selection from the band's career to date. Philipps has a wonderfully distinctive and appealing voice but with him caught behind a keyboard, the band is somewhat static on stage. However the use of a female vocalist for a couple of songs mid-set did inject a nice bit of variety.� And although I wasn't really in the mood for the lighter side of Prog', it provided an enjoyable enough listen. Excellent musicians - forgettable songs. 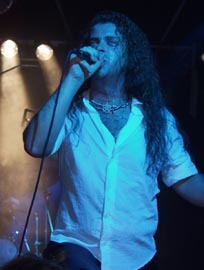 Englishman Ian Parry has a great voice but whether someone who could do a good job for Ronnie James Dio is best suited to this sort of music is debatable. Also the 80's stadium stagecraft of constantly urging the crowd to clap their hands, seemed to get on a lot of people's nerves. 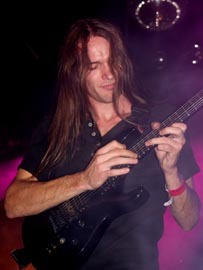 Guitarist Patrick Rondat knows his way around a fretboard but finding his way around the stage seemed too much for him. Hardly the biggest response of the weekend. Disappointing. 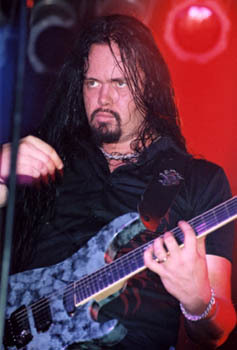 If, despite a lousy sound, an 18-hour drive to the venue and losing your bassist for ten minutes in the middle of the set, Evergrey can still play a blinder, then you know you've been watching something special. 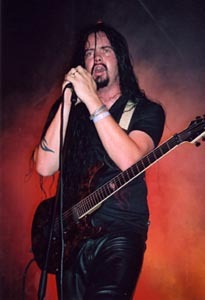 Fresh from a gruelling US tour in support of Arch Enemy and from the start Tom S Englund had the crowd eating out of his giant palms. Their current album Recreation Day has already shifted way more than their first three put together. 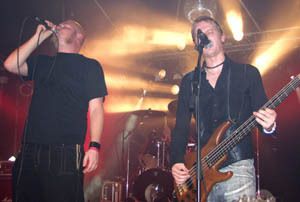 And while the disc is certainly heavy, onstage the band takes the power and energy onto another level. As I said, the sound was abysmal - at times you could barely hear Tom's vocals and I hardly recognised the opening track - a real shame as it was Blacked Dawn from their debut which I love! Despite this, the sheer brilliance of tracks like Mark of the Triangle and Blinded still managed to shine through. Since I saw them at last year's Sweden Rock Festival, Tom's command of an audience has grown considerably and despite two new members, the band has become an incredibly tight unit. They use of the stage and movement was a joy to watch. 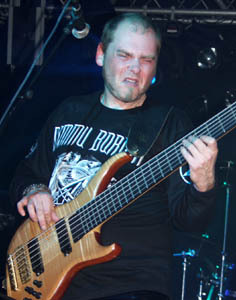 A few songs into the set bassist Michael Hakansson suddenly rushed off the stage. After ad-libbing for a few minutes (and making several references to the toilet?!) he decided to go into a rendition of the acoustic Trilogy Of The Damned. I don't know if this was originally part of the set but it certainly worked for me. Thankfully Michael returned, Tom borrowed a joint from a member of the crowd, took a puff, smiled and continued with the set. We ended on a high with Recreation Day, Nosferatu and The Masterplan and despite having taken in nearly 12 hours of music, the still packed hall, was going absolutely ape. The sound meant this didn't have the impact of the set I saw two years ago but it was a cracking way to end the festival. Always a point to mention, is that within five minutes of leaving the stage the whole band was out in the hall signing and chatting with their fans. There's talk of a special album from the band in the spring (taking bets on an acoustic album myself) with the next full disc due later in the year. Sadly I fear venues this size will soon be too small for this band by then. But when they're rich and famous, at least I'll be able to say I was there, when they laid waste to Baarlo. 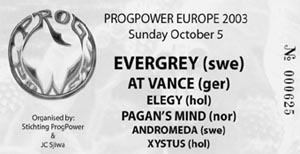 Progpower Europe 2003 was yet another triumph for the organisers. It must be damn hard to put on a festival for this sort of music. But that they managed to put together such a tasty bill with no obvious problems, was a great achievement. Small, but perfectly formed, Baarlo is a quaint base with free parking and a good selection of bars and eateries within a few minutes walk of the venue. The downstairs bar too, provides a good alternative if the music coming from the stage isn't your taste. The only complaint really was the sound. With this sort of music, more than most, it's imperative that you are able to hear all the instruments clearly. Hopefully next year someone who doesn't feel the need to play everything at '11' will be left in charge of the controls. All photos by Andy Read for DPRP © 2003.